Developed from the preceding Kagero-class destroyers, the very similar Yūgumo-class was a minor revision featuring new main gun mounts capable of high angle fire, reinforced AA defenses and a streamlined bridge structure. Replacing Kagero (as of Update 0.5.15) as the penultimate destroyer in this particular branch of the Japanese destroyer line is Yūgumo. Captains who have progressed this far up the branch will be well-familiar with the layout of the ship, but will probably be disappointed in how few improvements there are over Tier VIII's Kagero lurking inside the hull. One drastic improvement is the reload time of Yūgumo’s main battery guns. Her reload time is a mere 5.7 seconds; glacially slow by American destroyer standards, but a speed heretofore unseen with Japanese 127 mm guns. With the right mix of upgrades and commander skills that number can drop even lower, bringing her DPM close to a true gunboat, though she will still lack the raw DPM of American destroyers or the excellent ballistics of Russian destroyers. Her main battery range goes up significantly as well, further emphasizing the benefits of her improved reload speed. From Update 0.6.6 Yūgumo has the option of two torpedo upgrades from the stock Type 93 mod. 2s. First, there are the Type F3s, which are outrageously fast at 76 knots but at the cost of only having 8 km of range. The more recommended choice, however, are the Type 93 mod. 3s, which remain at 67 knots but offer a boost in range to 12 km as well as a damage increase. Most captains will choose to use the new final upgrade slot to improve the torpedo reload speed, further increasing her torpedo potential. Most everything else remains as it was from Kagero. Her speed improves slightly (0.5 knots), and her handling characteristics remain virtually identical. Her main battery is now dual-purpose, but practically in name only; it does a better job giving away her presence to nearby planes than actually defending the ship and should generally be ordered to hold fire. Her health pool goes up by the slimmest of amounts (400 hit points). Even Yūgumo’s detection radius is worse than Kagero’s, but it's very slight and not a serious handicap. Excellent reload speed for her main battery guns (in comparison to most other Japanese destroyers, that is). Has access to Upgrade Slot 3. Lowest detection radius among Tier IX destroyers. Very potent torpedo armament, capable of impressive reload speeds with the right mix of upgrades and commander skills. Can equip Torpedo Reload Booster. Lowest top speed among Tier IX destroyers; Yūgumo has a difficult time escaping enemy gunboat destroyers that are able to close with her. Highly vulnerable to enemy aircraft, especially if equipping Torpedo Reload Booster instead of Smoke Generator. Turret traverse time for main battery remains slow. Detection range of Type 93 torpedoes gives opponents more time to react than torpedoes from Fletcher or Udaloi. The mod. 3 torpedoes offer a boost in damage and increased flexibility due to the improved range, and should be researched first. Next, the hull will give a bit of extra survivability. The gun range can be saved for last. Like so many of her Japanese destroyer brethren before her, Yugumo’s flexibility in upgrade options is somewhat limited. Upgrade Slot 1 is best filled with Main Armaments Modification 1, while Upgrade Slot 4 and Upgrade Slot 5 should be filled with Propulsion Modifications 1 and 2, respectively. Concealment System Modification 1 is mandatory in Upgrade Slot 6. This leaves only a couple of upgrade slots that can truly customize how Yugumo plays. Torpedo Build: Most captains will opt to fully maximize Yūgumo’s torpedo armament. This means installing Torpedo Tubes Modification 3 in Upgrade Slot 3, and either Aiming Systems Modification 1 or Main Battery Modification 2 in Upgrade Slot 2. The latter may seem like an odd choice, but is a good hedge bet for when she finds herself in a close-quarters gunfight with the likes of a Fletcher or Gearing. In either case, stacking Torpedo Tubes Modification 3 with Tier 3 commander skill Torpedo Armament Expertise brings Yūgumo’s torpedo reload time for her Type 93 torpedoes down to slightly under 86 seconds; it drops to less than 80 seconds for the Type F3 torpedoes. These are terrifyingly low numbers that no opposing battleship driver wants to hear given how hard those torpedoes hit. Main Battery Build: Alternatively, Yūgumo is one of the only Japanese destroyers not named Akizuki that can realistically consider tailoring the ship around her main battery guns. By combining Aiming Systems Modification 1 in Upgrade Slot 2, Main Battery Modification 3 in Upgrade Slot 3, and the Tier 1 commander skill Basic Firing Training, Yūgumo drops her main battery reload time down to 4.5 seconds. While this is still 50% slower than Fletcher, it compares favorably to Udaloi. Playing Yūgumo in this style of build is challenging, but not impossible. Yūgumo is forced to choose between Smoke Generator and a downgraded version of the Torpedo Reload Booster consumable that Shiratsuyu and Akizuki have access to. Whichever one is chosen, captains are encouraged to invest the credits (or doubloons) in the premium version. As ever, Damage Control Party II is also highly recommended. Engine Boost II might be worthwhile for captains without Smoke Generator; otherwise, the free version should be more than adequate. 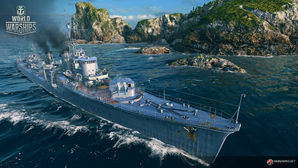 Players who wish to spend doubloons can equip Yūgumo with Type 19 camouflage that lowers her detection radius, reduces the accuracy of incoming shells, reduces her repair costs, and increases the amount of experience she earns. Yūgumo’s reliance on her torpedoes for much of her damage output make equipping Juliet Whiskey Unaone signal flags highly attractive, particularly for Torpedo Build captains; Torpedo Build captains will want to equip November Foxtrot flags as well, in order to improve the cooldown speed of Torpedo Reload Booster. Main Battery Build captains should equip India X-Ray and Victor Lima flags. Juliet Charlie and Sierra Mike flags are recommended regardless of build. Yūgumo fires a salvo of torpedoes. Yūgumo lays a smokescreen to shield a friendly Friedrich der Große battleship. Yūgumo joins an Amagi in the melee. Yūgumo fires a broadside at range. Yūgumo (夕雲?, "Evening Clouds") was the lead ship of her class of destroyer built for the Imperial Japanese Navy during World War II. Apart from the modified bridge structure — which reduced wind resistance and turbulence compared to the design on the Kagero-class — her class was visually indistinguishable from Kagero class vessels, and was otherwise very similar. These would be the final class of large anti-surface destroyer the Imperial Japanese Navy would produce. DesDiv 10 (Kazagumo, Makigumo, Yugumo) Participated in the Battle of Midway. Participated in the Battle of the Eastern Solomons. Participated in the Battle of Santa Cruz. Participated in the Naval Battles of Guadalcanal. Participated in the Guadalcanal Campaign. Participated in the Solomons Campaign. Participated in the evacuation of the Aleutians. Participated in the Battle of Vella Lavella. Kazagumo was torpedoed and sunk by submarine on 8 June 1944. Makigumo struck a mine and was sunk on 1 February 1943. Yugumo was sunk by surface gunfire and torpedo on 7 October 1943, during the Battle of Vella Lavella. DesDiv 31 (Naganami, Makinami, Takanami, Onami, Kishinami, Kiyonami, Okinami, Asashimo) Participated in the Guadalcanal Campaign. Participated in the Battle of Santa Cruz. Participated in the Naval Battles of Guadalcanal. Participated in the Battle of Tassafaronga. Participated in the evacuation of the Aleutians. Participated in the Battle of Empress Augusta Bay. Participated in the Battle of Cape St. George. Participated in the Battle of the Philippine Sea. Participated in the Battle of Leyte Gulf. Participated in the reinforcement of Leyte. Participated in Operation Tenichigo. Naganami was sunk by air attack on 11 November 1944. Makinami was sunk by surface gunfire and torpedo on 25 November 1943, during the Battle of Cape St. George. Takanami was sunk by surface gunfire on 30 November 1942, during the Battle of Tassafaronga. Onami was sunk by torpedo on 25 November 1943, during the Battle of Cape St. George. Kishinami was torpedoed and sunk by submarine on 4 December 1944. Kiyonami was sunk by air attack on 20 July 1943. Okinami was sunk by air attack on 13 November 1944. Asashimo was sunk by air attack on 7 April 1945, during Operation Tenichigo. DesDive 32 (Hayanami, Fujinami, Suzunami, Hamanami, Tamanami) Participated in the Battle of the Philippine Sea. Participated in the Battle of Leyte Gulf. Participated in the reinforcement of Leyte. Hayanami was torpedoed and sunk by submarine on 7 June 1944. Fujinami was sunk by air attack on 27 October 1944, after the Battle of Leyte Gulf. Suzunami was sunk by air attack on 11 November 1943. Hamanami was sunk by air attack on 11 November 1944. Tamanami was torpedoed and sunk by submarine on 7 July 1944. DesDiv 2 (Kiyoshimo, Hayashimo, Akishimo) Participated in the Battle of Leyte Gulf. Participated in the reinforcement of Leyte. Kiyoshimo was sunk by air attack and surface torpedo on 26 December 1944. Hayashimo was damaged by air attack and intentionally grounded on 25 October 1944, during the Battle of Leyte Gulf. She settled and was repeatedly attacked over the next 40 days until finally abandoned as a wreck on 3 December 1944. Akishimo was sunk by air attack on 14 November 1944. Makigumo at anchor, 14 March 1942. Kazagumo at anchor, March 1942. 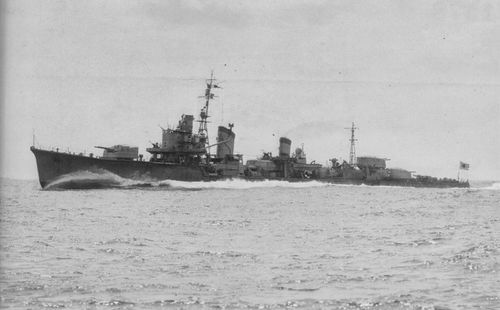 Hayanami underway, 24 July 1943. Hamanami on sea trials in Miyazu Bay, 10 October 1943. Asashimo at Osaka Bay, November 1943. Hayashimo at anchor, February 1944. Kiyoshimo underway, 15 March 1944. The remains of Akishimo in Manila Harbor, December 1944. Asashimo streams a large oil slick as she founders 150 miles south of Nagasaki, 7 April 1945. Line drawing of Yūgumo, with compartmentalization shown at bottom. This page was last modified on 13 September 2018, at 09:51. This page has been accessed 49,611 times.